If you are looking for something private, secluded, and very high-end, then Elsewhere Villa is for you. This ten-bedroom property includes a large main house, a pool house, and a garden cottage, and everything inside and out is top of the line. The sunny terrace with the large pool is an ideal place to hang out any time of day, and the staff will ensure that your stay is comfortable and relaxing. 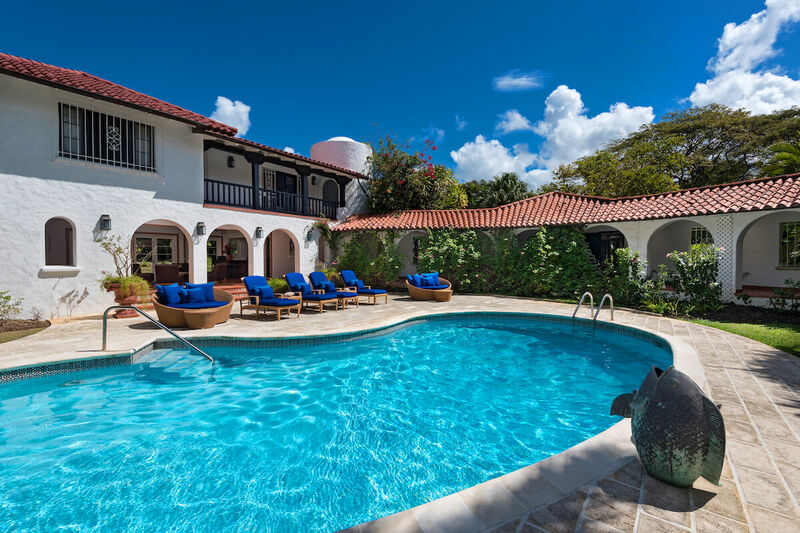 You can choose to unwind at the villa, the nearby beach, or with a round of golf at Sandy Lane. Elsewhere is a luxury villa nestled in the Sandy Lane Estate on the Platinum Coast of Barbados. Green monkeys in the gardens, hummingbirds darting through the air, and sunsets glowing on the horizon each evening make this villa a true tropical getaway. Breezes constantly flow through the villa’s courtyards, patios, and balconies. The exterior sprawls across two acres of ridgefront property with sweeping views, and a charming bar area overlooks the front and back gardens. The turquoise swimming pool is surrounded by daybeds and loungers, with vines growing up the nearby walkway and a series of arches leading into the outdoor living area. The upper level balcony has a shaded living area with ceiling fans, ocean views, and an al fresco dining table. There’s even a lily pond ensconced in manicured gardens on the lower level. This vacation rental is furnished to the highest standard with soft lights, vibrant artwork, and abundant seating. Elsewhere’s amenities include parking for six cars, WiFi, a fully equipped gym, flatscreen TVs, high-quality speakers, and a top-notch security system. The chef, Debra, is world class, and the entire staff is warm and hospitable. The main house has two wings with six ensuite bedrooms, a living room, and a kitchen. There are two master suites, two king suites, and two twin suites that can be converted into kings. Each bedroom has an ensuite bathroom and air-conditioning. The Pool House has two ensuite bedrooms above a large lounge area and bar. One suite has two twin beds that can be converted into a king, and one suite has a king bed. The charming Garden Cottage, with a living room and two ensuite bedrooms, opens to a private lawn and mahogany grove. One suite has two twin beds that can be converted into a king, and one suite has a king bed. Elsewhere is a five-minute drive from the Sandy Lane Owners Beach Club where guests have free access to a beach cabana, lounges, umbrellas, a snack bar, washrooms, and showers. Some of the best restaurants and duty-free shopping in Barbados is close at hand, as are some of the island’s picturesque golf courses. Private cabana on Sandy Lane Beach, owners club, which is approximately 1 1/4 miles from the Sandy Lane Hotel, which is on a ridge and has a slight incline. It would be approximately a 3 minute drive.